I always dread the end of summer simply because it is my favorite season. This morning on a call with a colleague, she mentioned the sense of “now we’ve got to get back to work” because Labor Day has come and gone. We know that holiday stress rises in November and December, but it never occurred to me that Labor Day stress could be a thing. Savor your morning coffee while reading an inspirational article before diving into your email. Book time for short breaks throughout the day. Even taking time for a cup of coffee between meetings will help you to relax and refresh. Keep a longer term calendar of your projects so that when new requests emerge, you can determine what’s possible and communicate. You still have a few days of sunshine – take meetings outdoors if possible. Keep up the volunteering – it’s a great way to stay connected to the things you love the most outside of work. I don’t like that summer is over, but I love these tips. What do you do to help maintain productivity during stressful times? Share your ideas on the Clairemont Facebook page. Story behind the photo: This summer I had the opportunity to visit wine country for the first time. 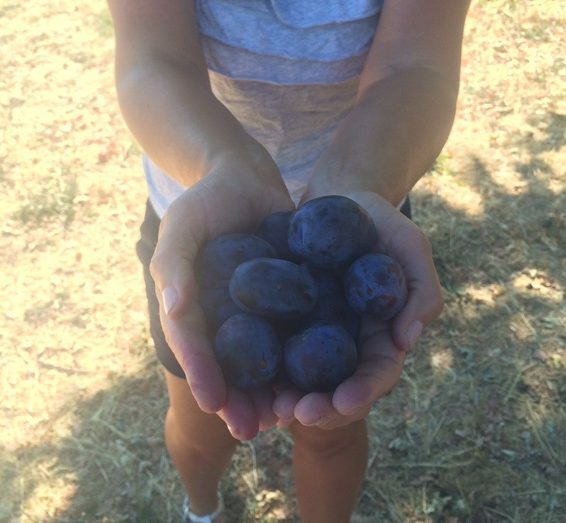 In addition to taking some amazing winery tours, I simply loved picking and eating fresh fruit. Plums don’t look like this in North Carolina! They were delicious.